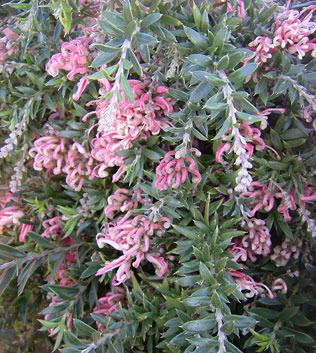 This dense shrub with arching branches has small green leaves, grey underneath, and candy pink flowers that appear in winter through to spring. Fast growing 6-8'high and as wide. Grows best in full sun and well-drained soils. Very frost hardy 16F at the nursery. Excellent dense hedge or specimen plant.